USB bands are the latest trend in the world of wristbands. Our USB bands have the added feature of including a fully functional USB drive that you can use to store data, presentations, multi-media files, and much more. These bands have all the great features of our popular silicone bracelets - they are made of high quality silicone that is non-allergenic, durable and comfortable wear. USB wristbands are popular with businesses and event organizers who use them to easily distribute promotional or informational files. You can customize your bands with your logo and message. These can be sold or used as promotional items, fundraisers, gifts, special occasions, or to raise awareness of important causes. Like all our wristbands, USB bands are available in a variety of colors and styles, including embossed, debossed, screen printed, ink filled, colorized and many more. 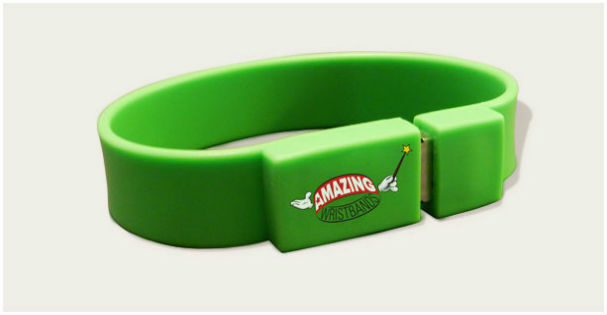 At AmazingWristbands.com, your complete satisfaction is our top priority. We offer competitive prices and completely latex-free wristbands.